People are rightly concerned about airport security, especially after events such as the downing of the Metrojet Airbus 321 on 31st October with the loss of 224 lives [Wikipedia]. It is suspected that Islamic militants managed to load a bomb onto the aircraft after breaching airside security checks at Sharm el-Sheikh airport. That incident resulted in the grounding of flights to Egypt and prompted some airports in the US to rethink their security measures. Such measures are employed to thwart terror attacks. However security officials often come across naive passengers attempting to take prohibited items on planes. Only this week TSA officials at Baltimore-Washington International Thurgood Marshall Airport found a woman trying to board a plane with a pair of gun-shaped stiletto heels. The shoes were in the woman's carry-on luggage, along with bracelets lined in faux bullets, and whilst harmless, the TSA officials were not amused since the agency prohibits passengers from carrying "replica guns or ammunition" through airport security checkpoints [Fox News]. It's not the only incident where someone has attempted to board with fake or even real weapons however. In another bizarre incident, also in China, a man was arrested after trying to board with a disused bomb in his luggage [Daily Mail]. And in September last year bomb disposal units were called to Toronto Pearson International Airport in Canada after a teenager tried to board a plane with an alarm clock designed to look like an explosive. The 15-year-old was travelling to Vancouver and was reportedly going through security when officials noticed the 'device' in his luggage. The explosive disposal unit was dispatched to Terminal 3, the screening area was shut down, and the surrounding area was evacuated for about three hours [Daily Mail / CBC]. 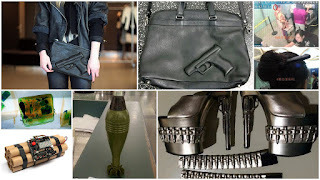 In July 2015 a woman sporting a handbag embossed with a gun was stopped at Bremen Airport in Germany by officials for arousing suspicion. The fashionable accessory, popularised by celebrity owners such as Rhianna, is part of the Guardian Angel collection by Dutch designers Vlieger & Vandam. Following the incident, Bremen Police in Germany have issued a photograph of the handbag and warned passengers not to travel through Bremen Airport carrying the item as hand luggage [Daily Mail]. Whilst most of these items might be harmless, or pose little risk to passenger safety, it beggars belief that some travellers seem to have little or no common sense when packing their suitcase.